Justin was born and raised in Lake Forest, California and graduated from the University of California, Irvine. He decided to jump out of his comfort zone and move to New York City to attend NYU's Doctor of Physical Therapy Program. Ruth is a DPT student from the University of Michigan in her final year. This is her second clinical rotation, each of which are 10 weeks long. She will graduate with her Doctor of Physical Therapy in August 2019. Ruth’s first clinical rotation was in the outpatient orthopedic setting where she worked with patients with a variety of diagnoses including post-operative, vertigo, balance, shoulder, hip, and spine patients. Ruth and her fiancé, Keagan, who is also a PT student from the University of Michigan, both came to Washington to gain experience working as student physical therapists near Keagan’s hometown of Bothell, Washington. Ruth enjoys spending time with family and friends and enjoys working out, hiking, running, and being outdoors. She has been having a blast exploring the state of Washington. Kelli Sato is originally from Bellevue Washington, where she attended Interlake High School. She graduated from Western Washington University in 2004 with a degree in Exercise Science. Kelli and Matt met in their undergraduate program and were married in 2005. Kelli has worked as a rehab coordinator, a Starbucks Barista, and even a Badminton teacher. In 2010 she got the opportunity to work as the office manager at Lake Washington PT. In 2016 her path took a new turn as she and Matt started to think about opening a clinic. Kelli manages the financial side of the business. It has been an interesting transition for her, as her youngest child started school to allow her to work every day. When Kelli has spare time she likes reading, yoga, fantasy football and golf. She also makes a mean strawberry rhubarb pie. Kelli loves to spend time with her husband Matt, two kids and dog Wickett. Wendell grew up in Bothell, WA where he attended Bothell High School. He first developed his interest for physical therapy in high school after injuring his ankle playing football. He continued to play in college at Willamette University in Salem, OR, where he recently graduated with a degree in Exercise Science. Aside from sports, Wendell has developed a passion for the outdoors over his years spent in Oregon. He is now working and gaining experience while preparing his applications to graduate schools to receive is doctorate in physical therapy. Olivia grew up in Wenatchee, WA. She became passionate about physical therapy after getting rehabilitated from a snowboarding knee injury. She is currently attending Northwest University in order to earn a B.S. in Exercise Science. After graduating, Oliviaplans to continue her education and earn a doctorate in physical therapy. 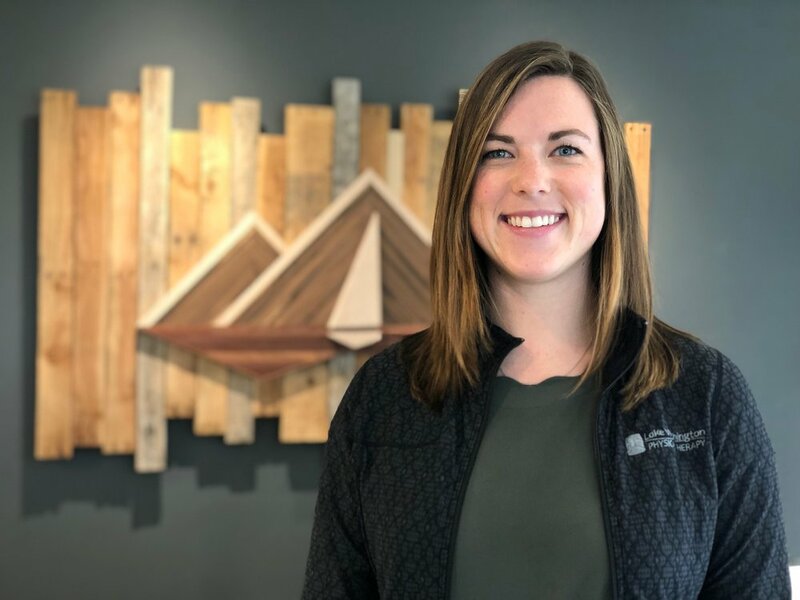 In her spare time she enjoys instructing snowboarding lessons, trail running, and backpacking. Her favorite area to backpack in is the Alpine Lakes Wilderness near Leavenworth, WA. Braedon grew up in Bellevue, WA, where he attended Bellevue High School. His curiosity about physical therapy began with his love of fitness and training. After having physical therapy done for an ankle injury, he knew he wanted to pursue physical therapy. He is currently working towards a B.S. in Exercise Science, and after graduation will begin the application process of being accepted into a Doctorate of Physical Therapy program. When not working or in class, he enjoys spending time with his wife, fishing, and off-roading. Savannah grew up in Shoreline, WA where she attended Shorecrest High School. All throughout high school she was involved in soccer, basketball, and track and field. She has always had a passion for sports, but it wasn’t until college when she herniated a disc that she became interested in physical medicine. Savannah received her B.S in Kinesiology from Oregon State University. Savannah plans on applying to graduate programs to be a Physician Assistant. In her spare time, she enjoys exercising and being outdoors. Drew grew up in Kenmore, WA. He is pursuing physical therapy because he is able to help people while also combining his interest for sports and physical activity. Drew is currently working towards a B.S. in Exercise Science from Northwest University. Upon completion, he hopes to start the process of applying to graduate school in order to earn his Doctorate of Physical Therapy. In his free time, Drew enjoys weightlifting, coaching soccer, and being outdoors with his fiancé. Sya grew up in Olympia, WA where she attended Timberline High School. She then went on to receive her B.S in Physiology along with minors in nutrition and philosophy from the University of Washington. Sya’s interest in physical therapy began after a string of soccer injuries led to spending ample time in clinics. Currently she is preparing her applications for graduate programs in the healthcare field and working on earning additional sports certifications. In her free time she continues to pursue her passion for soccer, travel and the outdoors.